remainin' in Sydney Street in the Calton. wur also boarn in this buildin'. Sydney Street looking north towards Duke Street. Nothing much left I'm afraid but spare ground. Seventy odd years ago when the photograph of the children in the street was taken there would have been tenement buildings, housing all they weans! Background in this photo top left is the Necropolis, top middle is Tennents Brewery. The church opened in November 1858 and united in February 1926 to form the Sydney Place and East Campbell Street United Free Church. It took is final name, Trinity Duke Street Church, when it merged with Wellpark Free Church in 1949. It closed for worship on January 25 1975 and became a hostel for homeless men for the next 21 years until it was finally closed following a fire. 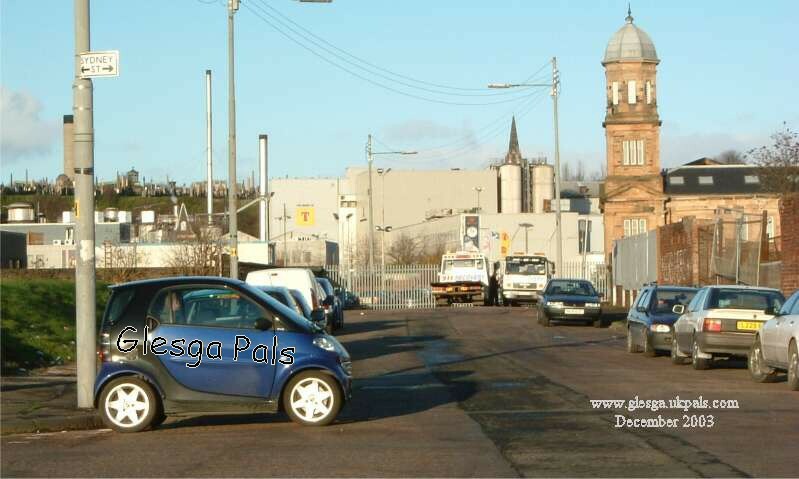 Webmaister: From yer pictures Ah kin see whaur yiv pit yer wee motor, bit whaur hiv ye pit ma wee street? Oor Kirk wis built in 1857 an' wis described " as a lush Grecian " which was greatly favoured by the United Presbyterian congregations at the time. Marion has mentioned oan the GP messageboard that she was present in this church in a ceremony in connection wi The Queen's Coronation. Noo,Ah ken yer a dab haun wi' cameras , long-distances lenses an' ither accoutrements,Webmaister, so it makes it difficult fur me tae figger oot whaur ye stood whin takin' yer pictures o' ma street. 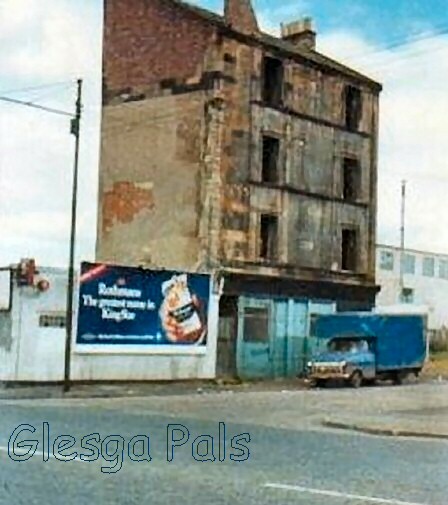 It wid brek ma hert if ye tellt me ye were locatit at the coarner o' the Gallowgate an' Sydney Street. Because, that wid mean thit a' the wee waarm hooses in which we bairnies used tae cuddle doon at night, an' a' the wee nooks an crannies whaur we played hide an' seek, hid gaun like snaw at the thaw. Ah wis boarn in 1928 at number 3 Sydney Street, wan of four generations wha' lived up the same close at the same time. We wir a' poor financially, but rich in spirit, maistly. My early days were happy, except for the time I caught Scarlet Fever about four years of age. Ah remember a' the people waitin' at the close mooth where stood the Fever Van. The hush wis like a funeral as ah wis pit intae the Van an' wheeched awa' tae Belvedere Hoaspital. Ah wis nivver the greetin, oar complainin' kind o' wean, bit ah felt abandoned. Wan day, we were a' taken oot oan tae the big lawn, an' a wee while later, a big airship/Zeppelin flew right ower the tap o' us. Everybiddy wis cheerin' wi excitement, bit, it didnae fizz oan me,'cos a'thit ah could think of wis gettin' hame tae ma mammy an a' ma pals in Sydney Street . Regards, Jim. From the Gallowgate ( which was 'behind' me ) all you see is spare ground, just about everything has been demolished... horrendous isn't it? " 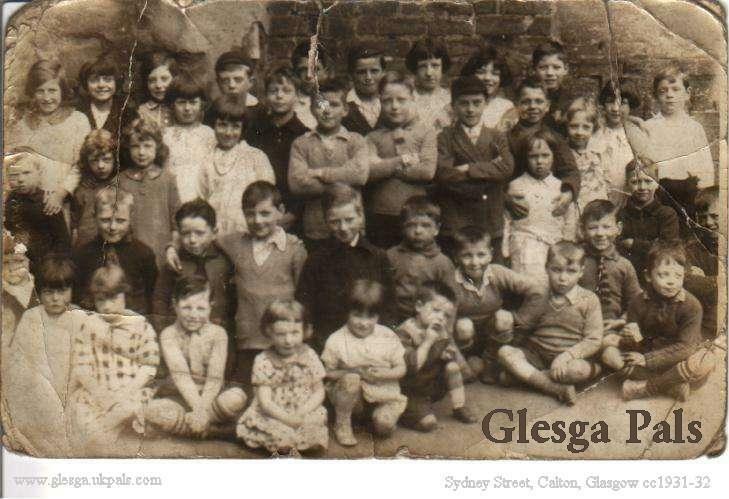 Oh where is the Glasgow...."
"Hello Wwebmaister, while looking through some old photos, I came across this one of Sydney Street weans---"The Pride o'The Calton." I'm the wee boy kneeling on the right of the front row with his finger on his cheek. My older brother Frankie is sitting at the right end of the second row. I think he's holding a deck of cards, or a pile of cigarette cards. Since I look like a three-year old, this photo must have been taken in 1931 or 1932. Noo, yer daein' a rerr joab wi the website, bit ye've no tae kill yersel daein' it......With Best Wishes, Jim Jeffrey."